The Alpha Magnetic Spectrometer on board the International Space Station released its first results today (read about them here) after having been in space since 2011. But this particle physics experiment was years in the making. In just 3 minutes, you can watch 16 years of building, preparing, launching and activating this detector. The first results from the largest and most complex scientific instrument on board the International Space Station has provided tantalizing hints of nature’s best-kept particle secrets, but a definitive signal for dark matter remains elusive. While the AMS has spotted millions of particles of antimatter – with an anomalous spike in positrons — the researchers can’t yet rule out other explanations, such as nearby pulsars. The positron fraction measured by AMS. Credit: CERN. The AMS was brought to the ISS in 2011 during the final flight of space shuttle Endeavour, the penultimate shuttle flight. The $2 billion experiment examines ten thousand cosmic-ray hits every minute, searching for clues into the fundamental nature of matter. During the first 18 months of operation, the AMS collected of 25 billion events. It found an anomalous excess of positrons in the cosmic ray flux — 6.8 million are electrons or their antimatter counterpart, positrons. The AMS found the ratio of positrons to electrons goes up at energies between 10 and 350 gigaelectronvolts, but Ting and his team said the rise is not sharp enough to conclusively attribute it to dark matter collisions. But they also found that the signal looks the same across all space, which would be expected if the signal was due to dark matter – the mysterious stuff that is thought to hold galaxies together and give the Universe its structure. Additionally, the energies of these positrons suggest they might have been created when particles of dark matter collided and destroyed each other. A screenshot from Ting’s presentation at CERN on April 3, 2013. ‘It took us 18 years to complete this result,’ Ting said. The AMS results are consistent with the findings of previous telescopes, like the Fermi and PAMELA gamma-ray instruments, which also saw a similar rise, but Ting said the AMS results are more precise. The results released today do not include the last 3 months of data, which have not yet been processed. 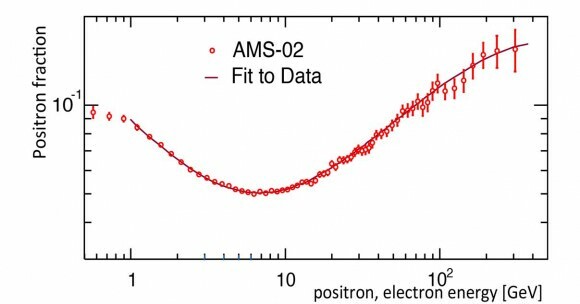 “As the most precise measurement of the cosmic ray positron flux to date, these results show clearly the power and capabilities of the AMS detector,” Ting said. Cosmic rays are charged high-energy particles that permeate space. An excess of antimatter within the cosmic ray flux was first observed around two decades ago. The origin of the excess, however, remains unexplained. One possibility, predicted by a theory known as supersymmetry, is that positrons could be produced when two particles of dark matter collide and annihilate. Ting said that over the coming years, AMS will further refine the measurement’s precision, and clarify the behavior of the positron fraction at energies above 250 GeV. Although having the AMS in space and away from Earth’s atmosphere – allowing the instruments to receive a constant barrage of high-energy particles — during the press briefing, Ting explained the difficulties of operating the AMS in space. “You can’t send a student to go out and fix it,” he quipped, but also added that the ISS’s solar arrays and the departure and arrival of the various spacecraft can have an effect on thermal fluctuations the sensitive equipment might detect. “You need to monitor and correct the data constantly or you are not getting accurate results,” he said. Despite recording over 30 billion cosmic rays since AMS-2 was installed on the International Space Station in 2011, the Ting said the findings released today are based on only 10% of the readings the instrument will deliver over its lifetime. Asked how much time he needs to explore the anomalous readings, Ting just said, “Slowly.” However, Ting will reportedly provide an update in July at the International Cosmic Ray Conference. KENNEDY SPACE CENTER – Space Shuttle Endeavour and her six man crew landed safely today at the Kennedy Space Center in Florida at 2:35 a.m. EDT following a 16 day journey of more than sixteen million miles. The STS-134 mission marked the end of Endeavour’s space exploration career. It was the 25th and last space mission by NASA’s youngest orbiter. Altogether, Endeavour has logged 299 days in space, orbited Earth 4,671 times and traveled 122,883,151 miles. The crew was led by Shuttle Commander Mark Kelly. Also aboard were Pilot Greg H. Johnson and Mission Specialists Mike Fincke, Drew Feustel, Greg Chamitoff and the European Space Agency’s Roberto Vittori. Vittori is the last non NASA astronaut to fly on a shuttle mission. The night landing capped a highly productive flight highlighted by the delivery of the $2 Billion Alpha Magnetic Spectrometer (AMS) to the International Space Station. AMS is a cosmic ray detector that seeks to unveil the invisible universe and search for evidence of dark matter, strange matter and antimatter. Four members of the crew conducted 4 spacewalks during the flight, which were the last by shuttle crew members during the space shuttle era. Simultaneously they completed the construction of the US portion of the ISS. During the flight, Mike Fincke established a new record of 382 days for time a U.S. astronaut has spent in space. He broke the record on May 27, his 377th day on May 27, by surpassing previous record holder Peggy Whitson. STS-134 was the 134th space shuttle mission and the 36th shuttle mission dedicated to ISS assembly and maintenance. “You know, the space shuttle is an amazing vehicle, to fly through the atmosphere, hit it at Mach 25, steer through the atmosphere like an airplane, land on a runway, it is really, really an incredible ship,” said Kelly. After the landing at the Shuttle Landing Facility (SLF) , Endeavour was towed back into the Orbiter Processing Facility (OPF) where she will be cleaned and “safed” in preparation for her final resting place – Retirement and public display at the California Science Center in Los Angelos, California. With the successful conclusion of Endeavour’s mission, the stage is now set for blastoff of the STS-135 mission on July 8, the very final flight of the three decade long shuttle Era. “We’ve had a lot going on here,” said Mike Moses, space shuttle launch integration manager, “Being able to send Atlantis out to the pad and then go out and land Endeavour was really a combination I never expected to have. STS-134 Endeavour Post Landing Press Briefing. As the shuttle era frenetically draws to a close, the launch views of the thunderous climb to orbit captured by NASA just get ever more stunning and vividly illustrate what it’s like to liftoff to space. Check out this awesome collection of high definition videos of Endeavour’s final blast off as recorded by cameras mounted on each of the twin solid rocket boosters (SRB’s) from multiple viewpoints. The STS-134 mission lifted off on May 16 from the Kennedy Space Center in Florida. The cameras show the launch from numerous spectacular angles and vantage points, pointed down to Earth and up to space, from alongside the belly of the orbiter and along the sides of the SRB’s. The videos show all the phases of the SRB in flight – including separation, parachute deployment and all the way to the dramatic splashdown in the Atlantic Ocean with rapidly changing backgrounds of the launch pad, Earth and Space. The STS-134 mission is the 25th and final flight of Space Shuttle Endeavour, NASA youngest orbiter. Endeavour’s six man crew is led by Shuttle Commander Mark Kelly, husband of Rep. Gabrielle Giffords. She was shot at point blank range and critically wounded during a routine congressional meet and greet with her constituents in January 2011. Endeavour is set to land back at KSC on June 1 at 2:32 a.m. EDT after a 16 day mission to the International Space Station. The crew carried up the $2 Billion Alpha Magnetic Spectrometer and attached this wor;ld class science instrument to the truss of the ISS. The AMS is a particle physics detector searching for antimatter, dark energy and dark matter. The goal is to elucidate the birth and evolution of the Universe. Side view of shuttle Endeavour stack and access walkways. The long-awaited Alpha Magnetic Spectrometer, a particle physics detector that could unlock mysteries about dark matter and other cosmic radiation, has now been installed outside the International Space Station. It is the largest and most complex scientific instrument yet on board the orbiting laboratory, and will examine ten thousand cosmic-ray hits every minute, looking for nature’s best-kept particle secrets, searching for clues into the fundamental nature of matter. By collecting and measuring vast numbers of cosmic rays and their energies, particle physicists hope to understand more about how and where they are born, since a long-standing mystery is where cosmic rays originate. They could be created in the magnetic fields of exploded stars, or perhaps in the hearts of active galaxies, or maybe in places as yet unseen by astronomers. The AMS is actually AMS-02 – a prototype of the instrument, AMS-01, was launched on board the space shuttle in 1998, and showed great potential. But Ting and his collaborators from around the world knew that to make a significant contribution to particle science, they needed a detector that could be in space for a long period of time. AMS-02 will operate on the ISS until at least 2020, and hopefully longer, depending on the life of the space station. The AMS will also search for antimatter within the cosmic rays, and attempt to determine whether the antimatter is formed from collisions between particles of dark matter, the mysterious substance that astronomers believe may make up about 22% of the Universe. “The most exciting objective of AMS is to probe the unknown; to search for phenomena which exist in nature that we have not yet imagined nor had the tools to discover,” said Ting. For more information about the AMS, NASA has a detailed article. [/caption]KENNEDY SPACE CENTER – The second time was a charm for Space Shuttle Endeavour as she blasted off this morning (May 16) from Pad 39 A at the Kennedy Space Center on her historic final mission under overcast skies after a two week delay caused by a heater malfunction in the orbiters critical hydraulic fuel lines. The threatening clouds moved in over the pad in the last 30 minutes of the countdown and nearly derailed the launch. Forecasters had predicted a 70 chance of favorable conditions. The Universe Today team of Ken Kremer and Alan Walters witnessed Endeavour’s exciting launch from the press site next to the world famous countdown clock. Check out our photo album here. Shuttle Commander Mark Kelly and his five crewmates lifted off at 8:56 a.m. EDT Monday on the STS-134 mission which will deliver a state of the art particle physics detector to the International Space Station. The $2 Billion Alpha Magnetic Spectrometer (AMS) could potentially revolutionize our understanding of how the Universe was born and evolved over time. The AMS is a world class science instrument sponsored by the United States and 15 countries around the globe. Nobel Prize Winner Samuel Ting of MIT leads the international science project. Endeavour’s three main engines roared to life six seconds before the twin Solid Rocket Boosters were ignited and pushed the shuttle off the pad atop a tremendous roar and brilliant flames shooting from Endeavour’s tail. Nearly half a million people flocked to the Florida Space Coast to be a part of history and witness the launch of Shuttle Endeavour on her 25th and final mission to space. Many hotels were sold out for the night. Numerous folks staked out their claim to a prime view location along area waterways and beaches by camping out for the night or by arriving many hours early to avoid the crush and clogged local roadways. Kelly’s crewmates are Pilot Greg H. Johnson and Mission Specialists Mike Fincke, Drew Feustel, Greg Chamitoff and Roberto Vittori of the European Space Agency. This is the first shuttle flight for Fincke and Vittori. Both Finke and Vittori flew to space atop Russian rockets on their prior spaceflights. Vittori will be the last international astronaut to fly aboard a shuttle. Endeavour is slated for a 16 day mission to the International Space Station which will include the final four spacewalks for the space shuttle program. The STS-134 mission is the penultimate flight of the shuttle program and the 25th and final one for shuttle Endeavour, NASA’s youngest Orbiter. If you watched Endeavour’s May 16 blastoff, send me your launch and crowd photos to post in an STS-134 launch gallery here at Universe Today. KENNEDY SPACE CENTER – The all veteran crew for the last launch of Space Shuttle Endeavour flew back to Florida today for their second try to lift off into space on the STS-134 mission to the International Space Station. This follows the launch scrub called by Shuttle launch managers on April 29 caused by a malfunction of critical heaters inside one of the orbiters three auxiliary power units (APU’s) which power the ships hydraulics. The weather forecast for Monday morning launch is currently “70% GO” and liftoff is targeted for 8:56 a.m. EDT on Monday, May 16. Stormy weather and rain is expected to sweep across central Florida over the weekend and clear out in time for the launch. But Sunday’s rain could potentially delay the retraction of the Rotating Service Structure – which protects the shuttle from bad weather – for a short time. Shuttle Commander Mark Kelly and his five crewmates arrived at the Shuttle Landing Facility at the Kennedy Space Center early this morning (May 12) at 9 a.m. aboard the Shuttle Training Aircraft (STA) after flying in from the astronauts training base at the Johnson Space Center in Houston, Texas. “It’s great to be back,” said Kelly to the large crowd of reporters, including me, gathered to greet the crew. “We really appreciate all the hard work by the team that’s worked over the last couple of weeks to get shuttle Endeavour ready. We are really excited to be here, excited to launch, hopefully on Monday if the weather holds. Kelly is joined on the crew by pilot Greg H. “Box” Johnson and Mission Specialists Mike Fincke, Andrew Feustel, Greg Chamitoff and Roberto Vittori. Vittori is a European Space Agency astronaut and spoke first in his native Italian language and then in English. Kelly and Johnson will fly practice landings in the STA in the remaining days prior to Monday’s launch. The STA is a modified Gulfstream II jet which handles like a space shuttle. Mission Specialist Mike Finke whipped out a camera and photographed the gaggle of media as we were photographing them – a rare and thrilling experience for all of us. Finke tweeted the photo of us a short time later – and is included here. Technicians at the Kennedy Space Center have been working around the clock since April 29 to determine the cause of the heater failure and fix the problems. The malfunction was traced to a switch box located in the aft section of the shuttle. Shuttle workers swaped out the ALCA -2 load control assembly box. Then they retested the new unit and qualified it for flight. as we photograph the crew upon their arrival in Florida on May 12. See Finke’s twitpic above. Humongous crowds are again expected to travel to prime viewing locations around the Kennedy Space Center and pack the local hotels, roadways and beaches. Flocks of tourists are already arriving in anticipation on Monday’s launch. About 750,00 folks had swarmed to Florida for the April 29 launch attempt. STS-134 is the penultimate mission in the Space Shuttle Program. The last shuttle flight by Atlantis is expected to occur in early July, but a firm launch date has not yet been set. If you do attend Endeavour’s launch, send me your launch and crowd photos to post in an STS-134 launch gallery here at Universe Today. One of the most anticipated science instruments for the International Space Station — which could find the “hidden universe” of anti matter and dark matter — has arrived at Kennedy Space Center. The Alpha Magnetic Spectrometer (AMS-02) is now ready to head to space as part of what is currently the last scheduled space shuttle mission in February 2011. Dubbed “The Antimatter Hunter,” the AMS is the largest scientific instrument to be installed on the ISS, and comes as a result of the largest international collaboration for a single experiment in space. “Even before its launch, the AMS-02 has already been hailed is already as a success. Today we can see in it with more than a decade of work and cooperation between 56 institutes from 16 different countries,” said Simonetta Di Pippo, ESA Director of Human Spaceflight. AMS measures the “fingerprints” of astrophysical objects in high-energy particles, and will study the sources of cosmic rays — from ordinary things like stars and supernovae, as well as perhaps more exotic sources like quark stars, dark-matter annihilations, and galaxies made entirely of antimatter. AMS moved to transport vehicle. Credit: Alan Walters (awaltersphoto.com) for Universe Today. Each astrophysical source emits a particular type of cosmic rays; the rays migrate through space in all directions, and AMS-02 will detect the ones that pass near Earth. With careful theoretical modeling, the scientists hope to measure those fingerprints. By observing the hidden parts of the Universe, AMS will help scientists to better understand better the fundamental issues on the origin and structure of the Universe. With a magnetic field 4,000 times stronger than the magnetic field of the Earth, this state-of-the-art particle physics detector will examine directly from space each particle passing through it in a program that is complementary to that of the Large Hadron Collider. So, not only are astronomers eagerly waiting for data, but particle physicists as well. Samuel Ting. Credit: Alan Walters (awaltersphoto.com) for Universe Today. The AMS-02 experiment is led by Nobel Prize Laureate Samuel Ting of the Massachusetts Institute of Technology (MIT). The experiment is expected to remain active for the entire lifetime of the ISS and will not return back to Earth. The launch of the instrument was delayed so that the original superconducting magnet could be replace with a permanent one with a longer life expectancy. Now as KSC, the AMS will be installed in a clean room for more tests. In a few weeks, the detector will be moved to the Space Shuttle, ready for its last mission. The AMS-02 is an experiment that we hope we’ll be doing lots of reporting about in the future! A switch-out of the magnet for a much anticipated particle physics experiment on the International Space Station will force NASA to delay the final flight of the space shuttle until at least November, and change which orbiter and crew will fly the final space shuttle mission. The $2 billion Alpha Magnetic Spectrometer was scheduled to head to the ISS in July of this year, but recent thermal vacuum tests showed the superconducting magnet that was originally planned to power the experiment would have only worked 2-3 years. An ordinary magnet, which doesn’t need to be super-cooled will last for a decade or more – and given the ISS has been given a longer life, it seems to be the best option. “I don’t think it’s correct to go there for three years where there is a chance to do physics for 18 years,” said Dr. Samuel Ting, AMS Principal Investor, in an article in the New York Times. NASA officials said today they still are evaluating the exact day in November, as they must schedule the mission to fit around other resupply and crew flights to the ISS, with the Russian Progress and Soyuz vehicles. The AMS is designed to search for various types of unusual matter by measuring cosmic rays, and will help researchers study the formation of the universe and search for evidence of dark matter and antimatter. Changing the magnet means the AMS won’t arrive at Kennedy Space Center before August and shuttle workers need time to get the payload ready to fly inside the shuttle’s cargo bay. The upcoming flight of the shuttle Atlantis (STS-132) remains on schedule for launch no earlier than May 14. But Endeavour was scheduled for the AMS flight in July, which will now move to no earlier than November. Discovery’s STS-133 flight (bringing up the Leonardo MPLM as a permanent storage module) stays on the schedule for September 16. So while the schedule changes, numerical order is restored! Another possible change to the shuttle schedule would be if the decision to fly what is called STS-335, the Launch On Need mission, a shuttle ready to go as a rescue ship for the last scheduled mission. Many shuttle supporters say since Atlantis would be ready to fly that it should fly. No decision has yet been made, however. Even if the final flight or flights get delayed into 2011, funding is not a problem, as Congress anticipated possible delays and provided funds for shuttle operations into early next year. Liquid helium would have been used cool the superconducting magnet’s temperature to near absolute zero. But tests showed the helium would dissipate withing 2-3 years, leaving the seven-ton experiment useless. The ISS has been extended to at least 2020, and possibly as long as 2028.